Both the Guernsey and Jersey breeds of dairy cattle originate from islands off the British mainland -- the Isle of Guernsey and the Isle of Jersey. The closely related breeds share some physical similarities. The Jersey is the second most-common dairy breed worldwide, after the Holstein. The American Livestock Breeds Conservancy includes the Guernsey on its "Watch" list, as a breed whose numbers are dwindling. Medium to large-framed, Guernsey cows mature at about 1,400 pounds. The majority of them have horns, although polled Guernsey lines exist. The "golden" Guernsey ranges in color from pale fawn to reddish gold. Cows might be solid-colored or white-spotted. The gold extends to skin color. 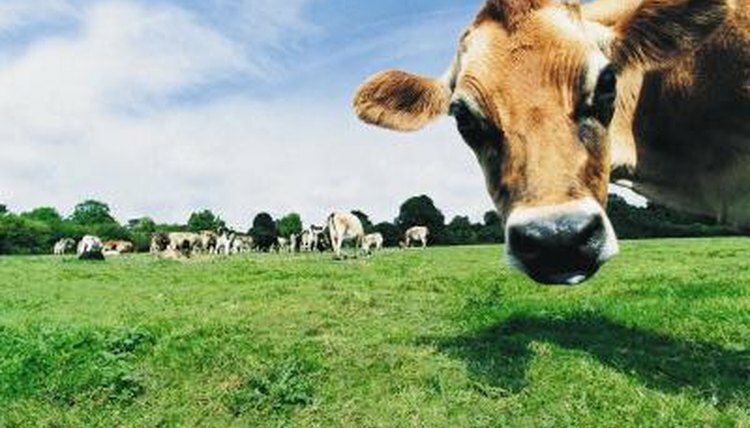 The Jersey cow is smaller than the Guernsey, weighing between 800 and 1,200 pounds fully grown. The Jersey is among the smallest of all dairy breeds, with a small-to-medium frame. The Jersey breed is more refined than the Guernsey, markedly in the shoulders and head. While the "classic" Jersey cow sports a solid-colored fawn coat, Jersey colors run the gamut of brown shades. The face and hips are a darker hue than the body color. Purebred Jerseys are born with horns that are often removed as calves. The Guernsey didn't receive the nickname "golden" just because of its coat. Their high-fat milk is also that shade, loaded with beta carotene and protein. The Jersey cow's milk content is high in butterfat and often used in cheese-making. Advocates for both breeds allege their breed produces the best-tasting milk. While the smaller Jersey produces more milk on less feed than the also-efficient Guernsey, the latter matures earlier. This leads to earlier calving and longer lifetime milk production from the Guernsey. While both breeds are relatively docile cows, the typical Guernsey cow boasts a gentle disposition. That makes the breed ideal for novice owners or as family farm cows. Although intelligent, the average Jersey is "usually somewhat more nervous in disposition than the other dairy cows," according to the Oklahoma State University ag website. While the cows are manageable and friendly, Jersey bulls are considered the worst-tempered of all dairy breeds. Guernseys are used more often for crossbreeding than Jerseys. In New Zealand, Guernsey-Jersey crosses are common, resulting in hardier cows producing larger quantities of milk, and higher calf survival rates, according to the World Guernsey Cattle Federation. World Jersey Cattle Bureau: Why Choose the Jersey Breed? American Jersey Cattle Association: Why Jersey? What Are the Milk Cow Breeds?